Average Weight	: 100-130 lbs. The Bullmastiff was obtained by crossing 60% Mastiffs with 40% Bulldogs in the country of England. 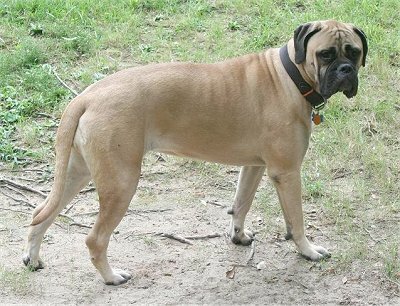 Mastiff Bulldog types can be found in records as early back as 1795. In 1924 Bullmastiffs began to be judged. Three generations of breeding of Bullmastiffs was required for Bullmastiffs to be registered as purebreds. The dogs were fierce and threatening, but were trained not to bite the intruders. When the need for gamekeeper's dogs decreased, the dark brindle dogs so good for night camouflage gave way in popularity to the lighter fawn coloration. It has been prized as a hunting guard, as an aid in army and police work, and is used as a watchdog by the Diamond Society of South Africa. Today's Bullmastiff is a reliable family companion and guardian. It enjoys living with the family, with whom it comforts itself well. Loyal isn't strong enough of a word to use to describe the Bullmastiff. This is a dog breed that's often called courageous for its ability and desire to protect those it feels it needs to protect. This protective instinct is not punctuated by a fierce attacking stance, however, but rather an action to divert the danger away from the person that is being threatened. While the Bullmastiff will attack if it feels that is the only option, generally speaking, it will simply just stand between the stranger/intruder and the person the dog is protecting. The usual response in highly threatening situations is for the dog to physically stop the danger, but if that doesn't work, the dog will catch the intruder and knock them down, holding them until they are told to let them go. Often, this dog will simply "mouth" on the intruder and not bite them, making them a great watchdog or companion when you're out at night. However, just like any other dog that's fearful for its life, in certain situations, it will bite and attack more aggressively. The coat of the Bullmastiff is short and rough, making it simple to take care of for most owners. Regular brushing will help you manage the shine and the health of the fur. Using a short coarse bristle brush on the fur at least once a week will allow you to remove any dead or loose fur from the exterior of the dog. This will also help you minimize the shedding that the Bullmastiff is sometimes associated with. Some owners swear that you will have Bullmastiff dog hair on everything you own - even if you're brushing it regularly. The short hairs tend to stick to everything and anything they come into contact with. While you might think the Bullmastiff breed is going to want to run around, asserting itself, it's actually quite the opposite. This is a dog that will actually prefer to be lazy and to lay around the house - perfect for the not so active person. However, this isn't a healthy practice for them, so it's advised that you take this dog out for regular exercise and daily walks to encourage this dog to stay in shape. Since this is a bigger dog, you will want to make sure the dog is getting regular exercise to avoid weight gain, which could hasten the appearance of certain health problems, like hip dysplasia. Taking this dog along on walks will help to keep them in shape, but they will need to be trained not to pull on the leash. In addition to a regular exercise program, you will want to make sure you are monitoring how much the Bullmastiff eats. As this breed is prone to putting on weight, it's advised that you follow the vet's directions implicitly in terms of feeding. With such a strong appearance, the Bullmastiff is impressive enough in its natural abilities of intimidation, but you need to get a handle on training this dog breed early in its life. Because of the strong need to protect the family it's with or the person that it deems its owner, you will need to find ways to control this protective instinct without snuffing it out. This can begin with socializing the Bullmastiff when it's a puppy. Allow this dog to interact with other puppies to help it become more used to other dogs; if that's the setting you bring it home to. If you are going to have a family setting around the Bullmastiff, you will want to bring it home as a puppy so that it learns who it needs to feel are its family. When children grow up with this dog breed, there can be a very playful and loving relationship. These dogs can be quite affectionate with those they are owned by and will be protective once this relationship is established - without additional training from you. As a part of its nature, the Bullmastiff is going to be a drooler and a snorer, so be ready for these behaviors when you first bring this dog home. Puppies will tend to be awkward too when they're first in the home, but they will gain their agility quickly as they get older. These Bullmastiffs respond to your tone of voice as they are quite sensitive to the changes, so be sure to remember this when you are training them and maintain a consistent tone. It can help to bring this dog breed to obedience classes, if possible in your area, but you will need to maintain their lessons once they come home. Consistency is a big thing to keep in mind with this dog breed, as with nearly every breed. They need to know that you are the one that's in charge and that for certain behaviors, they will be reprimanded or scolded, but for others, they will be praised. However, it's never a good idea to send a Bullmastiff to a kennel or pen if they have not behaved correctly or even as a part of their natural routine. They want to be around people and can become irritated and hard to manage when this interaction is taken away from them. It's important that the owner of this breed be able to assert their authority over the dog, as this is what will make the dog see that they are being loyal to the right person. Be sure to demonstrate that you are in control of the situation at all times.